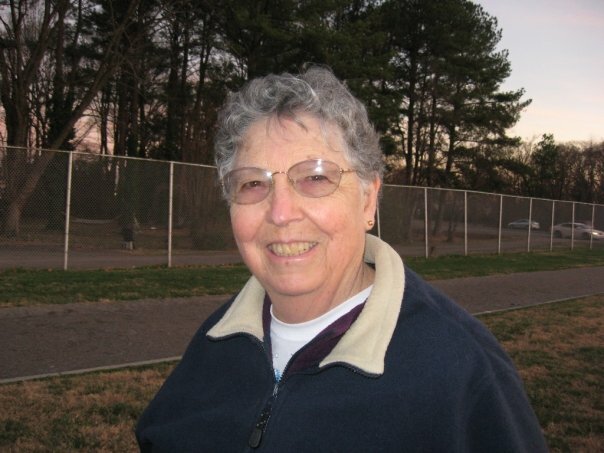 Here’s a special guest blog post, by Suzi’s Mom, Marty Miles. Mom helps out on the blog when Suzi is buried under some sort of vegetable, its pumpkins this week. Marty lives in Northern NY, on the Canadian border half the year, and the other half of the year just outside of Ashland, VA, near Richmond. Fall is here at the Lake, the leaves are turning color and some places here in the North Country have already had their first frost. Everyone with a garden is scurrying around picking everything that the frost would damage. They are canning, pickling and freezing as much as they can for the winter. I had lunch with a friend this week. Their beautiful new home is built on the forty acres where Rick’s family has farmed for several generations. I parked out beside the house and came in through their garage, which was full of tomatoes spread out to ripen. 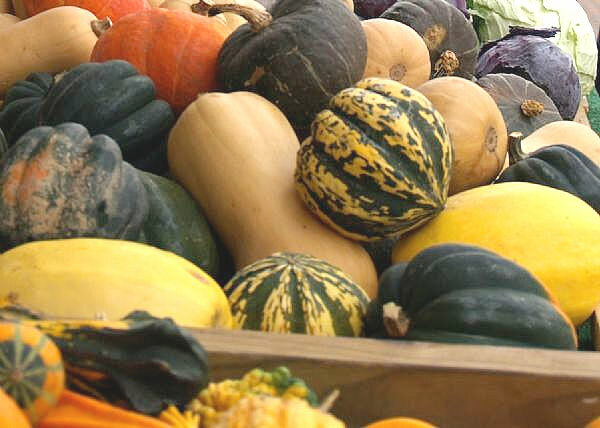 They had winter squash of many varieties and a huge pail of acorns saved for the wild turkeys this winter. We took a tour of their gardens and I was amazed at how many gardens they had and the diversity of the vegetables and fruit that they raise. The field out by the road still had a lot of pumpkins waiting to be picked. I saw sunflowers nodding their heads and some corn that hadn’t been cut. The wild geese or turkeys will enjoy that. There were several apple trees just loaded with apples…some will be preserved for the winter, but there will be some for the deer, too. I saw a patch of rhubarb, a field of strawberries and Beth mentioned the many quarts raspberries that they picked. I saw a raised bed of lettuce and Beth told me that they keep it mulched and covered from the weather and they will have it well into the winter. They did the same with their carrots, which are quite hearty and will stand a lot of cold weather. All of their gardens are fenced, which I assume is to keep out the rabbits and deer. There were grape vines growing on many of the fences and Beth told a wonderful story about the wild turkeys jumping to reach the grapes. Some were able to fly up and balance on the wire to feast on them. I wish I had taken my camera, so you could see what a wonderful place they have. I got to take home a bag filled with winter squash, which just happens to be my favorite fall vegetable. I can remember visiting Suzi’s Auntie Mae Otis on the farm. They always had a huge garden. Mae’s mother-in-law, Elsie Otis, and two of her elderly maiden daughters, Alice and Agnes, lived on the farm as well. All of them were outstanding cooks and there was always some sort of baked goods to be enjoyed when we visited. 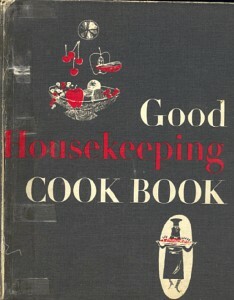 I have lots of recipes in my cookbook from the Otis’…Date Roll Cookies, Whoopie Pies, (Oh, those Whoopie Pies! They were over two inches thick and were sooo good. 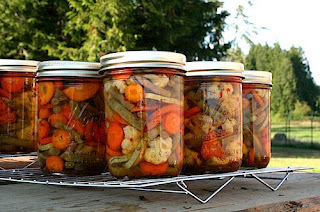 ), and Alice’s End of the Garden Pickles, which brings me to the Otis recipe for today. These pickles use ten different vegetables from the last of the garden and are some of the best and most colorful pickles you’ll ever eat. 1. Salt the following vegetables and soak overnight in ½ cup salt and 2 quarts of water. 5. Mix all of the vegetables together. 7. Simmer 10 minutes; pack in sterilized pint jars and seal. Last week I made some borscht for my granddaughter who has been begging for it. This recipe uses some more of those end-of-the-garden vegetables we have been talking about. Borscht comes from Eastern European countries where potatoes, cabbage and beets are staples of their diet. 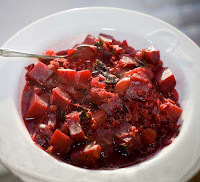 Cold borscht is made from young beets chopped, and boiled with their greens. The mixture is cooled and mixed with sour cream, soured milk or yoghurt. Raw chopped radishes and cucumbers are added and it is served chilled with dill or parsley. Sometimes they added hard-boiled chopped eggs. There are many different ways to make hot borscht. Some start with a rich meat base, while others are just made with vegetables. What goes into your borscht depends on the country of origin and what you like. I found it interesting that in some areas borscht is known as a sour soup. Sometimes it is made from fermented wheat bran and other times it is left to sit several days until it naturally sours. Today we ‘sour’ our soup with the addition of vinegar or lemon juice. I don’t know the country of origin of this recipe and, although it does call for the juice of a lemon, it is not a sour soup. All I know is that it is easy to make and is wonderfully delicious with a dollop of sour cream on top. This recipe comes from Muriel Blaisdell, a friend who is now teaching at Miami University in Oxford, Ohio. Serve with sour cream and yogurt and crusty bread. I can’t wait for the fresh cabbage from the garden. A cabbage salad or coleslaw made from new cabbage tastes so much better than those made from the cabbage in the grocery store at other times of the year. I have at least four or five different recipes for salad made from cabbage. This fall I found a new one in a Pillsbury Great Grilling cookbook…you know the ones that they have at the checkout in the grocery stores. Actually I was looking for different recipes for cooking fresh vegetables on the grill when I found this recipe for Asian Cabbage Salad with Peanut Butter Dressing. 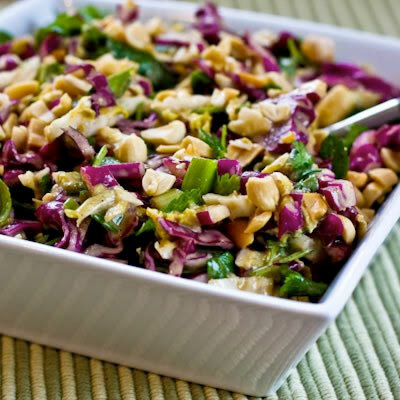 You may know of the Asian Cabbage Salad made with toasted Sesame seeds and slivered almonds. You crumble up some chicken flavored Ramen noodles in the salad and use the flavor packet in the dressing. It makes a delicious crunchy salad and if you have never tried it, you can find the recipe online. This salad is very similar, but it has peanuts to go with the Ramen noodles and uses peanut butter in the dressing. In medium bowl, combine all dressing ingredients including contents of seasoning packet from soup mix; beat well with wire whisk. Place noodles from soup mix in small bowl; break into small pieces. Put the cabbage, carrot, cilantro and onions in a large salad bowl and mix well. Add the dressing and toss well. Just before serving, fold in the dry noodles. Sprinkle the peanuts on top. You might like to add some garlic and ginger, and something hot—red pepper flakes, Tabasco, or chilies-for zing, and a little honey or maple syrup for just a touch of sweet in place of the sugar. You can also add some grilled sliced chicken breast to make the salad into a main dish. I hope you enjoy these end of the garden recipes. Here’s a special guest blog post, by Suzi’s Mom, Marty Miles. Marty lives in Northern NY, on the Canadian border half the year, and the other half of the year just outside of Ashland, VA, near Richmond. Having had a garden all my life, I could truly appreciate her thoughts on this prolific vegetable. Melt butter in skillet (I use my Dutch oven.) Add squash and cabbage. Cover and cook over medium heat for about 5 minutes. Uncover; add green or red pepper. Cook over low heat, turning occasionally with a spatula, until squash is tender, about 10 minutes. Stir in seasonings, herbs and vinegar. Adjust to taste. We like a little more vinegar than this recipe calls for. Makes 6 servings. To feed five hundred and three. Tender and juicy and green. That sneakily grew in the night. You’ll need a squash that will fit in the largest baking pan you have, turkey roasting pan or broiler pan. I have used longer squash and cute them in half so they would fit, but it’s harder to scoop out the middle and stuff them. Cut the zucchini in half lengthwise. Put it in the pan, cut side up,with a little water and boil until the center of the squash is soft. Let it cool a little so you can handle it. Scoop out the center, leaving just the skin and about 1/2 inch of squash so the skin maintains its shape. Be careful you don’t break the skin. The squash that you scooped out of the shell. a quart of tomatoes, either fresh or canned. A cup of fresh mushrooms, coarsely chopped. Or use a can of mushrooms, drained. The recipe calls for celery salt, but it would probably be better with some finely chopped celery. It takes forever to cook to a paste, so you can add some crumbled crackers or dry breadcrumbs to help thicken. Stuff the filling back into the shell. Bake on a cookie sheet, or in roaster or broiler pan. Just be sure the pan has sides. Sprinkle some Parmesan cheese on top. I have a note on my recipe that says it warms up beautifully. Zucchini for snacks in between. In dishes unheard of or dreamed. It’s turning my fingernails green! And last…Zucchini Bread. Sorry, my recipe must be in Virginia. Maybe one of you will send your recipe to Suzi to post. I just have to tell you about the first time i ever had Zucchini Bread. 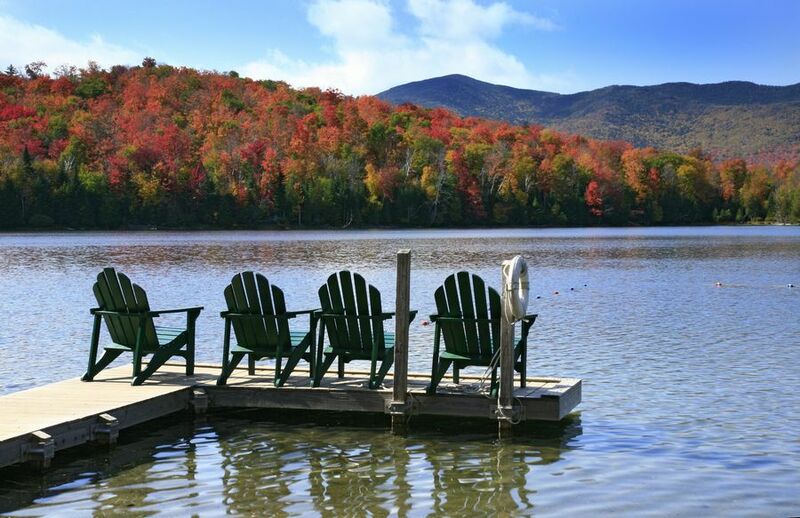 Our chapter of Adirondack Mountain Club hiked in to John’s Brook Lodge, in Keene Valley, NY for a weekend mountain climb. John’s Brook Lodge has two rooms, the kitchen and dining room on the right and the bunk room with 6 or 8 bunks on the left. the kitchen has one of those wonderful old cast iron cook toves, where we cooked blueberry pancakes for breakfast. We were preparing dinner the first night, when my friend Jane pulled Zucchini Bread out of her pack. It was round, cooked in a Bundt pan with powdered sugar sprinkled on top. Mmmm! It was so delicious that we couldn’t stop eating it. But imagine! Carrying Zucchini bread in your pack all two miles into camp! I think that was the trip where all the kids went wading in John’s Brook, and one fell in. Was that you Suzi? or Crystal? If I see another I’ll scream. I’m sure you’ll find lots of other ways to enjoy your zucchini, and other summer squash. We enjoy it sliced and fried in butter. And don’t forget to put some in your ratatouille. One summer we had a surfeit of zucchini and tomatoes, so I cooked up a canner full of tomatoes, zucchini, onions, celery and Italian herbs. I canned many pints of it and they made wonderful gifts to friends and family. This recipe is for a 2-qt freezer. Our old one was bigger so I made 1 1/2 times the recipe. Then we got a 6-qt freezer and I had to figure out the amounts all over again. Do your math so the recipe fits your freezer. You can add whatever kind of fruit you want, but we are having rhubarb ice cream here. In double boiler, scald milk. Mix sugar, flour, and salt; stir in enough milk to make a smooth paste. Stir the paste back into the hot milk in the double boiler. Stir until thickened. Cook covered, 10 min. Beat eggs slightly stir in milk mixture; return to double boiler; cook 1 minute. Cool; add vanilla, cream and fruit. I would make some rhubarb sauce. The recipe is below. Drain it and add between 1 1/2 to 2 cups of drained rhubarb. Freeze in 2-gt. or larger crank freezer until difficult to turn, using 8 parts crushed ice to 1 part ice-cream salt. To Ripen: When ice cream is firm, draw out water from freezer; wipe off and remove lid. Take out the dasher and give the kids spoons to scrape the ice cream off (this was our reward for all our hard work cranking away and my favorite memory – Suzi); plug opening in lid. Pack ice-cream mixture down; re-cover. Repack freezer as follows: If serving within 2 hours, use 1 qt. crushed ice to each 1 cup ice cream salt. ; if holding ice cream longer, use 2 qt. ice to each 1 cup salt; cover with heavy cloth. Makes 1/1/4 qt. You can see it’s a lot of work. Johnny and Suzi would help Dad crank. With all that work, you can see why we got a bigger freezer. Add whatever fruit you want– right now fresh peaches, nectarines, blueberries, blackberries, plums and apricots would be delicious. Strawberries and rhubarb are classic together. Adjust your sweetener according to the sweetness of your fruit, which can vary. You can also freeze fruit, even rhubarb. Just wash, cut and pack in some plastic bags then freeze. You will be able to enjoy wonderful fruit treats next winter and impress your family and friends. One year at Christmas I added 1 1/2 cups of crushed raspberries that we had picked the previous summer and frozen, sweetened with 1/4 cup of sugar. It was delicious. Here’s the rhubarb sauce recipe, which is tasty on its own. It would taste great on top of vanilla ice cream, or lemon, or mix it into Moogurt with some granola. You can use it as a sauce for meat and poultry. Let me know how you end up using it. This is the sauce that keeps old folks young and active. My sister-in-law Marguerite who is 85 eats it every day, and still mows her lawn herself. Mom packed all the ingredients for this legendary cake in a pack basket and cooler and we paddled down the Oswegatchie River on a week long canoe trip. Partway through, she pulled out her rhubarb, and whipped up this stellar treat like an Adirondack Martha Stewart using a reflector oven (here’s some info from the Scouts, who also like to use them.) It was very exciting for my friends on the trip and I don’t remember having any leftovers for the woodland creatures. It’s an easy-peasy cake to make, not especially nutritious, but it is festive and nourishes your soul which is also important and can make up for white sugar on occasion. I’ve made it for rooftop parties on Manhattan’s Avenue B and Southern potlucks in RVA and it wows them every time. The pan practically gets licked clean. I can remember watching 4 people scraping away at the pan with spoons at a 4th of July cookout. Put rhubarb in 9 X 13 inch baking pan. Mix sugar and jello. Sprinkle over rhubarb. Pour dry cake mix over rhubarb mixture. Pour water over all. Melt butter and pour over top. Do not mix! Bake 25 minutes at 325 degrees. Cool and serve. * Use a gluten-free box cake for GF version. I like Gluten Free Pantry. 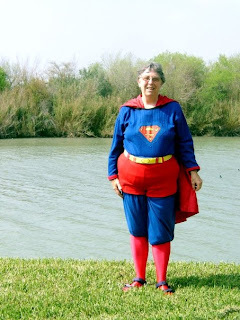 My Mom, Marty, has enthusiastically embraced the Farm to Family Wife blog. So I decided that instead of her hodgepodge posting of recipes in the comments page, she needs to share them in the blog itself, so everyone can enjoy them. She is a great writer, and an amazing cook, and she was responsible for my earliest culinary adventures. Mom grew up on a depression-era dairy farm in Northern New York’s St Lawrence Valley on the Canadian border, back before farms were mechanized like they are today. She remembers when they got running water in the house. Her father used to sing to the cows. Her mom had LOTS of chickens. But I’m sure she’ll tell you some of those stories. She’s responsible for my love of everything food, (although I have yet to really embrace okra and lima beans, but that’s another entry) and made sure that our vegetables were never overcooked. We always seemed to be on a camping trip for my birthday when I was a child, and she would bake a scratch birthday cake for me, in a reflector oven over the campfire. She used to cook gourmet meals on our canoe trips, including rhubarb cake, again with the reflector oven, because she could carry the ingredients in the canoe. She taught us how to bake Johnnycake on tin can stoves during cub scouts. Mom was a wonderful forager, and during her “Stalking the Wild Asparagus” Euell Gibbons phase, she made me eat milk weed. I appreciated all this. In looking back, she really was a Super Mom. Here are some of Mom’s tomato recipes she put in the comments page…. (comments in parenthesis are mine). I can’t wait until the cherry tomatoes are ripe so that we can have it again. Our vegetables are away behind yours here in the North Country. Add other salad vegetables. I slice baby cucumbers, green onions or red onions or Vidalia onions, chopped or sliced or however you like them. Sliced black olives are a must. The secret of this salad is in the dressing. Although I never measure the vegetables, I am very fussy about measuring for the dressing. Garlic chopped. Recipe calls for 1 clove, but I put in 4 last time and it was better. Chill before serving. It’s better the next day, if there’s any left, but you need to bring it out half an hour or so before you eat. as the oil solidifies. I couldn’t resist adding my favorite corn chowder. We just had it the other day and is one of my favorite chowders. The recipe calls for salt pork, but when I am in Virginia I use side meat. We can’t get that here in the North Country, so I froze some and brought it home with me when I came home for the summer. Corn-if you have fresh corn, you should use about 6 cups and you should add it towards the end. Fresh corn shouldn’t cook more that five minutes. If not, use 2 cans of cream corn and 1 can of regular corn. 5 potatoes, peeled and diced. In a Dutch oven, cook the side meat or salt pork over moderate heat, stirring occasionally, so that all of the the pork pieces become brown, but not too dry. Remove the cooked meat with a slotted spoon and set aside. Saute onion in the drippings until just tender, but not brown. Remove the onion with a slotted spoon and discard the fat. Return the onion to the pan and stir in canned corn, water, potatoes and salt, cooking, uncovered until the potatoes are almost soft. (If you’re using fresh corn, add just before potatoes are done. Cook five minutes.) Add milk and simmer very gently for 10 or 15 minutes. Add pepper. Sprinkle the surface with the pork pieces. Serve immediately. Serve with some nice crusty bread. I always thought this would be good with some seafood, such as crab.